The PAC 512 can control all aspects of two secure doors, with up to two card readers installed as entry and exit readers on each door. This enables the PAC 512 to support a door strike to lock and unlock a door and a door contact to detect the door positions. A programmed auxiliary input is put on each door which can be used for alarm system integration, and an auxiliary output that enables a buzzer or strobe when security is breached or a door is left open. Each PAC 512 controller has a tamper input, this enables monitoring of cabinet doors, and an override input that can release both doors. 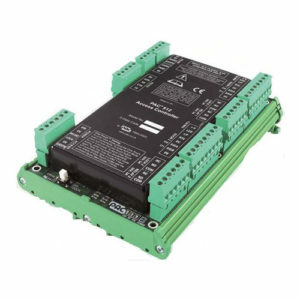 The PAC 512 can be used standalone with optional IP connectivity or as part of a system controlled by the PAC 500.